" Tanya is a talented teacher and her enthusiasm is contagious. We received so much great feedback about her design demonstrations and her positive and inclusive approach. Everyone who meets Tanya instantly falls in love with her. We look forward to collaborating with her again in the future." - Erin Benzakein, founder of Floret , Washington USA. Learn to design a rambling and romantic summer bridal bouquet & large-scale installation using 'real life' techniques with the beauties of late summer & early autumn - a bounty of summery garden blooms, tropicals, delicate textures, trailing vines and foraged foliage branches. 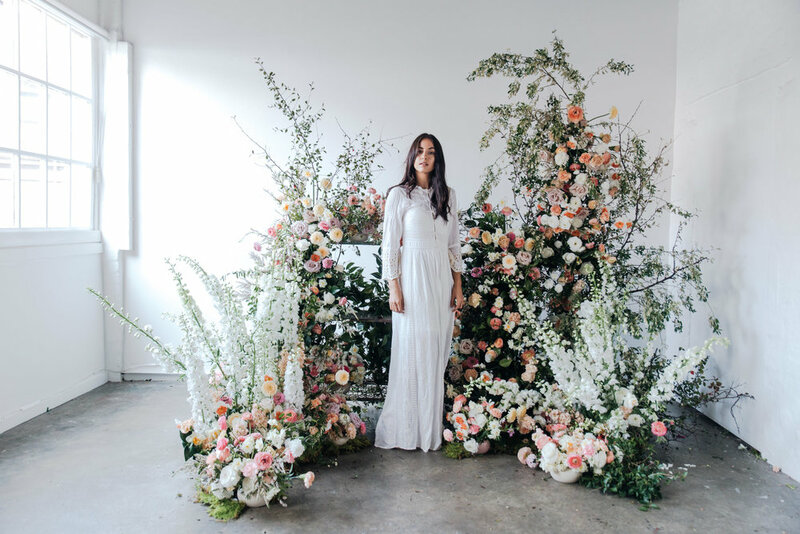 You'll work with the season's best, while Tanya demonstrates her way of flowers and shares the design knowledge she's gained from her afar travels. Tanya will share her favourite bontanics for the season and tips and tricks achieving the look you want in your designs. We'll take inspiration from Tanya's most favourite season, Summer! Think, those warm balmy nights, overgrown gardens thriving in the heat and the sunkissed tropics mixed with her signature nature-inspired style. We will cover a brief overview of Tanya's favourite ways to use colour, texture and form to achieve a free & untamed style while remaining intentional to your designs. All attendees will have access to an array of flowers and foliages to create their bouquets. Following, Tanya will demonstrate a large-scale installation, and together we will work together as a team to complete its abundance. Students will have their work beautifully styled and professionally photographed for their portfolio. Following our design time, we will sit down (with a wine!) to discuss all things business, growth & social media. Tanya will share her business processes, pricing guide and finding her feet in the market. Attendees are welcome to prepare questions prior to the workshop. This class is suitable for all design levels. It is aimed at those mad flower lovers, beginners within the floral world & those wanting to expand and refine their skills, style & portfolio. To keep things intimate and to maintain a great learning environment, there is a maximum of 10 students for this class. The first instalment is paid when reserving your place, the second payment is due 5th Feb 2018, and the remaining payment due 14 days prior to the workshop date. 10.30am - 5.30pm. The address will be sent to you upon booking. There is limited street parking nearby. We encourage you to arrange a ride or keep in mind there may be 10-15 min walking distance from parking. There is a minimum of 6 students needed for the class to be held. In the unfortunate event, we do not meet this minimum, all students will receive a full refund. SORRY, SOLD OUT - Please click here to register your interest for future workshops.